The BRS (Banana River Special) model. For this design, I analyzed my past boards, the bump and jump Naish Starship, the RRD Freestyle Wave, the Quatro Tetra Freewave. I wanted to take what I liked from those, and discard what I didn't. Creating a board I would want to blast around on in the Banana River. 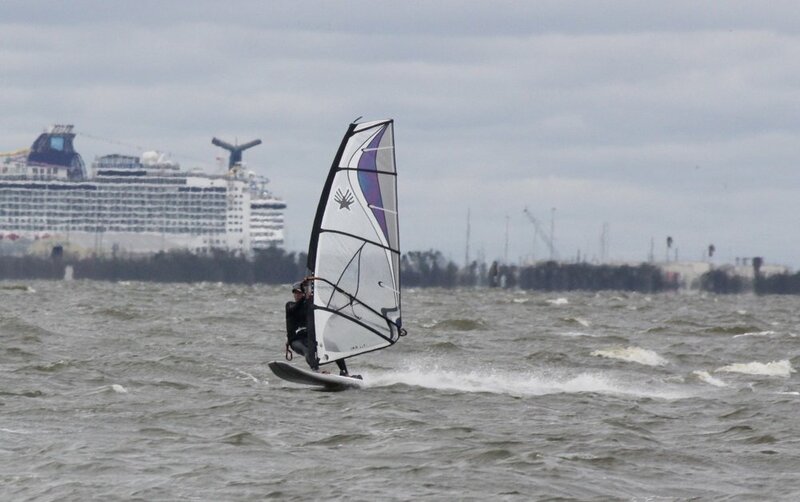 Particularly days when windsurfing would be my choice over kiting. My target wind range was 6.1m to 4.5m. Basically, one board in my van. A thin-my-quiver model. Good get up and go. A good ride in the Banana River chop. Old school jibes, smooth, not tight. Plus speed, lots of easy speed. Check out this session on the 4.5m in our worst chop. I was in complete control and able to push for all the speed she could give me. It was so much fun flying on the tail.